If you've ever wished you could get a different finish from your foundation (without necessarily buying another one) then Urban Decay The Velvetizer Translucent Mix-In Medium is just the product you've been looking for. Urban Decay The Velvetizer Translucent Mix-In Medium can be mixed into any foundation or BB Cream (as well as sunscreen) to get a velvety (not harsh) matte finish on the skin. It is completely translucent, so it won't leave any white or grey finish to the skin or in your foundation product. All I had to do is mix a dime-size amount of the Urban Decay The Velvetizer Translucent Mix-In Medium powder into my foundation ( it can also be used with their Urban Decay Naked Skin Weightless Ultra Definition Liquid Makeup or Urban Decay Naked Skin One & Done Hybrid Complexion Perfector ), and instantly I had a beautiful texture and nice, matte finish. My skin felt and looked velvety smooth, yet still naturally matte. The Urban Decay The Velvetizer Translucent Mix-In Medium didn't change the color of my foundation products or disturb how long wearing they were. I didn't get any skin irritation and it didn't cause my foundation to flake, ball up or smudge. 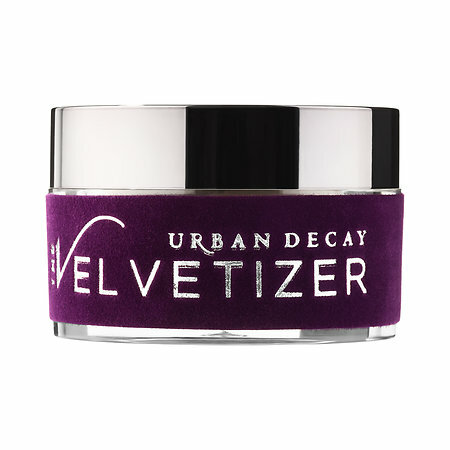 As far as the wear during the day, Urban Decay The Velvetizer Translucent Mix-In Medium kept its matte, velvet texture, and it also helped keep my t zone from getting as oily as it normally would (but this is not an oil blotting or mattifying product).